Press Mag Media is pleased to showcase one of its latest print advertising campaigns. 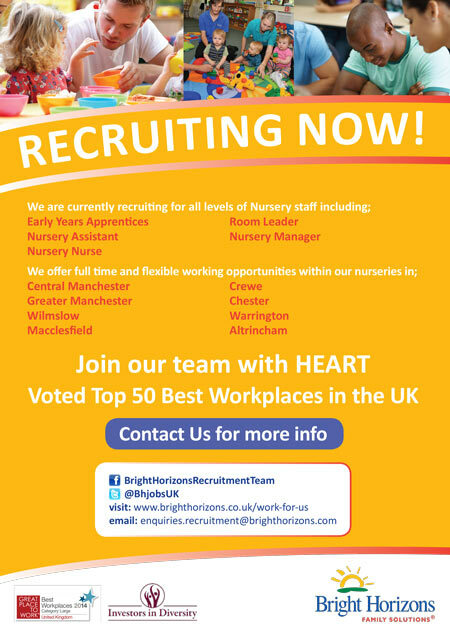 By working alongside Bright Horizons Family Solutions, a high-exposure campaign has been coordinated to promote the childcare provider’s current job vacancies. The ads have taken the form of leaflet inserts, with a total of 100,000 placed across issues of Manchester’s famous daily newspaper, the Manchester Evening News. Striking and colourful in its design, the leaflet draws attention to Bright Horizons’ new job opportunities, with simple text informing readers of the M.E.N of the vacancies available across its North West-based nurseries. The ad also highlights Bright Horizons’ status as one of the Top 50 Best Workplaces in the UK, and includes social media call-to-actions and email and website information. The M.E.N, with a large readership, is an ideal publication to advertise in, and advertising with inserts allows the company to present its message in a distinct, stand-alone medium and maintain maximum control of its creative. Bright Horizons has been recognised for excellence both as a childcare provider and as an employer, with its nursery network consistently receiving a higher than national average percentage of ‘Outstanding’ and ‘Good’ judgements at statutory inspection. It is the only childcare company to be have been listed in the last eight years as one of the country’s top 50 ‘Great Places to Work’ by the Great Place to Work Institute.